Apple has revealed the pricing for the new iPhone 7 and iPhone 7 Plus in India. The pricing for the current iPhone 6s and iPhone SE has also been revised with double the storage on the 6s models. This can surely be termed the biggest price cut ever by smartphone giant Apple in India, the company has slashed the prices of its smartphones by as much as Rs 22,000. Apple iPhone 6S (128GB), which carries an MRP of Rs 82,000 so far, will now be available at an MRP of Rs 60,000 after a price drop of Rs 22,000. The price cuts come as the India launch of the company's latest iPhones -- iPhone 7 and iPhone 7 Plus -- nears. Apple will launch the new iPhones in India on October 7. Though Apple has not yet officially started the pre-orders for the two phones, several resellers of the company has already started accepting the pre-bookings for the device. The iPhone 7 Plus 32GB, 128GB and 256GB will cost Rs 72,000, Rs 82,000 and Rs 92,000 respectively, while the iPhone 7 32GB, 128GB and 256GB will be priced at Rs 60,000, Rs 70,000 and Rs 80,000 respectively. 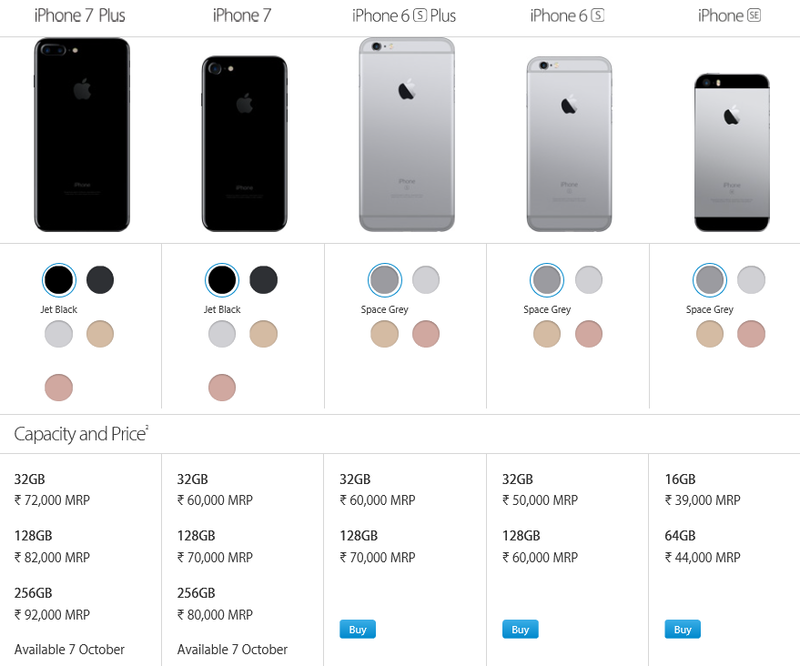 Here are the new prices on iPhones in rupees.